When we moved here I was beyond excited about having Chipotle, they’re not perfect but they are a great compromise restaurant that we do fine at while on the GAPS (grain free) diet. But after eating there the second time I realized how easy, cheap, and fun it would be to just replicate their Burrito Bowl at home! By pre-soaking the beans I can reduce the phytates and starch in them, and then I can cook them low and slow in chicken stock to add additional amino acids and gelatin, which is so healthy for the gut. We omit the rice, but if you wanted you could cook rice in chicken stock as well. Season beef and start browning in a cast iron or stainless steel skillet over medium-high heat, breaking up the beef as it cooks. As the beef browns, chop the tomatoes, onions, and parsley and toss together. Grate the cheese. Wash and tear lettuce, place in bowls. 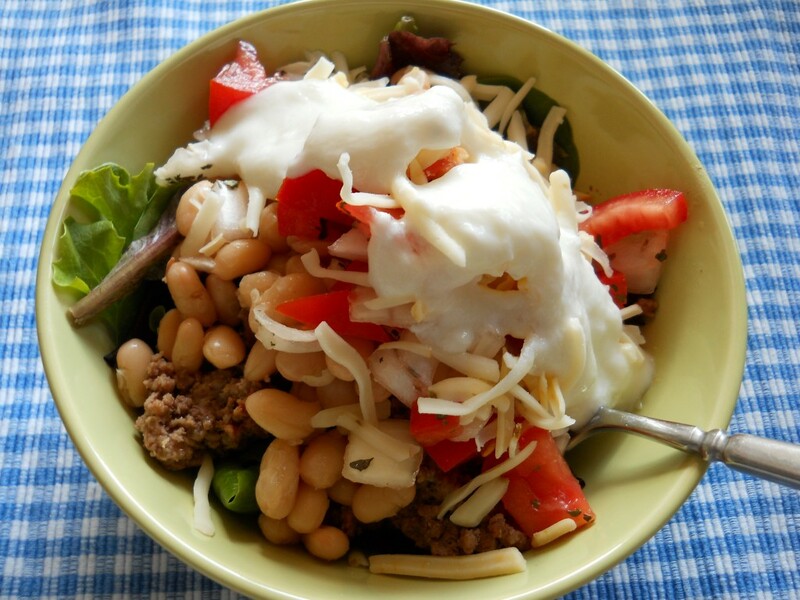 Top lettuce with beans, meat, tomato mixture, cheese, guacamole, and sour cream. Each person can adjust the toppings as they desire. Do you like reminders on your calendar to start things like this ahead of time? Whole foods diets need all sorts of preparation instructions and the Grain Free Meal Plan has those all built in- never forget to soak beans, culture veggies, or make yogurt again! Soak beans: Rinse one pound (2 cups) of navy beans in a colander, removing any rocks or debris that may be in the package. Put in a large bowl (they will swell to triple their current size) and cover with filtered water so that they are covered by an inch or more. Allow to soak for 24 hours, changing the water once during this time period. Cook soaked beans in crock pot overnight (or all day) on low with 2 quarts chicken stock and 2 quarts of water, adding a pinch of baking soda if they do not get soft. Add salt to taste, approx 1 tablespoon. Extra beans can be frozen for easy use later! This looks fantastic – thanks! I love Chipoltle too – especially their guacamole – but for some reason I always come away with indigestion. I’ve tried not getting any corn or cheese but still do – perhaps it is the phytates in their beans. Anyway thanks for the alternative! Chipoltle uses soy oil in most of their recipes. I love their food, but I don’t go there since I found out about the soy. MMmmmmm oh but you forgot the avo/guac! I usually order it without the rice OR beans, double meat, sour creama nd guac. Delish! FABULOUS idea!! I love Chipotle burrito bowls and get them once a week, but they are a bit pricey in my opinion. I don’t pay the extra 1.85 for guac! LOL! But yes, I’ll add a recipe to the post, we love guacamole! I was disappointed to learn that Chipotle uses soybean oil in most of their cooking , which I didn’t realize. This recipe is a great alternative, as their food is delicious! yikes!! Are you sure about this?? I made this last night using BPA-free, canned organic black beans, because that’s all I had in the house or time for. I also skipped the dairy, as we can’t tolerate it. It was outstanding!!! We love Chipotle too, but they put something into their meat that we are sensitive to, so we’ve had to do without. I am soooooo very happy to have a new, easy and delicious GAPS recipe for dinner that actually tastes better than it’s carryout counterpart. Thank you! Or don’t, and ferment the excess and enjoy later! I love love love guacamole! This was INCREDIBLE. Thank you for the idea! This would be great with grilled or sauteed peppers added, too!